Thread: Meater wire free probe intergration. Has anybody got the single probe version of the 'meater' wire free thermo probe yet, if so what their thoughts are. I am not an owner of one since I have backed a 4 probe 'block' version (not shipping yet) and have little details to share except for what is on the indiegogo backers page. I believe the single probe version is being shipped however. My main question is aimed towards the heatermeter gurus out there - whether or not this sort of device could be integrated with my beloved heater meater units. Shoving a probe in some meat and not worrying about all those wires seems like a dream; rotisserie, foil wrapping nirvana!! those have been mentioned before I think. I know Bryan has at least 1. there's a Meater thread from the kickstarter timing that I bumped a couple months ago. I bought 2. My one-word review is 'meh'. I have a big steel keg - My phone has to be within a few feet to hold signal. No way to calibrate - at room temp, my 2 probes read 8*F different. At higher temp, they get closer, but it still is annoying. I haven't spent much time on it other than to pair the Meater probe with a bluetooth dongle under Linux to see what the protocol looked like. I assumed they'd just use the UART (serial) profile but they have their own custom HID for the protocol so Linux has no driver for it. I assume that means they have their own custom bluetooth-level protocol in addition to the on-the-wire protocol. I'm fairly good at reverse engineering protocols if I can get bit/byte-level dumps, but because I can't even get that due to a custom bluetooth HID, I didn't put any further effort into it. They've also said there will be an open API at some point, but I believe they intend it to poll their cloud services rather than allow other devices to integrate directly with it. I have also identified that the time stamp starts at the 158th hex value and is comprised (as far as I can tell right now) of the 158th and 159th hex values. Some of the values appear to be excess-128 numbers like the seconds of the timestamp and the first number of each of the probe values. I also believe these values are little endian values of a sort. Last edited by LKSpencer; 02-14-2019 at 02:43 PM. Each of the probes has a leading 08 (possibly a position of sorts) followed by the internal/external thermistor values then a 10 in the middle followed by the other internal/external thermistor values and finally ending with an 18. The hex 08, 10 and 18 are constants and are increments of 8 (decimal) so I am guessing they have some positional significance, but are not part of the temperature readings themselves. Last edited by LKSpencer; 02-14-2019 at 02:59 PM. 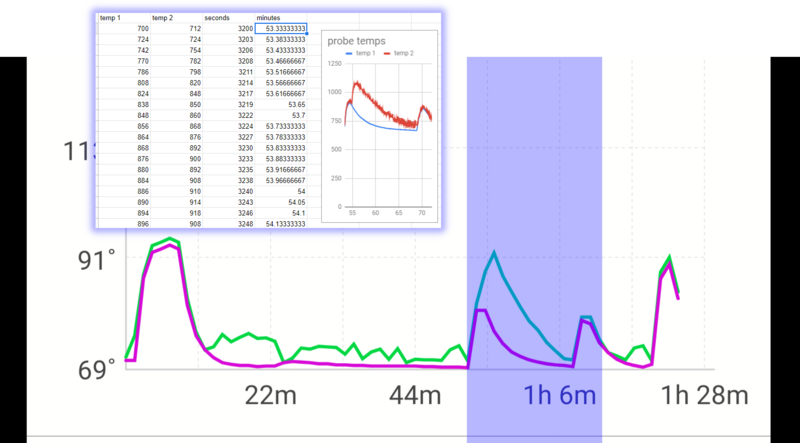 pulled the two temps from the thermistors of one of my probes along with the timestamp and ran them through that little function above, then plotted the values in a chart. The following image shows my plotted values and times with the chart from the meater app highlighting the same time range that my data matches. It looks like they are smoothing and possibly decimating the data in their map, but I would say the two charts are close enough to call this progress. Last edited by LKSpencer; 02-16-2019 at 09:18 AM. Interesting. So are you sniffing TCP/IP packets going to and from the Meater servers or is this bluetooth BLE sniffing? I was sniffing wifi packets and they appear to be UDP, not TCP. My block is sending UDP packets over port 7878 and they look like they are multi cast packets, so I wrote a simple program for an ESP32 chip to connect to my router and grab those packets off of that 7878 port. I should be able to start consuming this information. My ultimate goal is to couple this ESP32 chip with a digital pot that can inject the temperature values into my blower so that I can get rid of the need for my blower wire as well. I already have that half of the equation worked out, so once I wrap up this stuff with the Meater block I should have a working prototype and no more wires going in to my smoker!